1. Income Tax limit:- one of the most expected thing and must included in budget 2016 is to increase the income tax limit. Currently we have tax exemption for annual income of Rs.2,50,000/-. The common man, middle class family which comes under this class are highly expecting from finance minister to increase income tax exemption limit up to Rs.5,00,000/- per annual income. We had same expectation from new modi government to increase tax exemption limit up to Rs.5lac annually, but they just increased Rs.50,000 (from2 lac to 2.5 lac). Update :- No Change in Income Tax Limit, The Income Tax is same as previous year. 2. No increase in Service Tax :- Last year, one of the most unexpected thing in budget was the raise of Service Tax and swachh bharat cess. From 12% of service tax to 14.5 of Service tax raised. Which directly affected middle class and lower class of india. The raise in service tax just increased cost of Rs.10000 of goods to Rs.10,145/-. Since, there are very less chance of decreasing service tax, indian people are expecting atlest no raise in service tax rate. Because, service tax is something for which we need to pay for buying everything. If you go to restaurant, go to movies, buy anything grocery or anything, you pay your part of service tax. Specially, house wives who deal with day to day finance will be benefited from no rise in service tax, in case they reduce service tax, it will be well and good. Update :- Government has raised Service Tax from 14.50 % to 15% after adding Krishi Kalyan Cess of 0.5%. 3. Corporate Tax Limit :- In last budget, government of india reduced 5% of Corporate tax which benefited a lot to corporate world. Which was one of the best relief for business peoples, CEOs and small entrepreneurs. Corporate world is expecting same budget reforms this year too. Even Corporate world is in demand of single tax system (Goods and service tax bill, GST BILL) which is pending in Rajya sabha since long and wish to implement very soon. Update :- Govt has not changed corporate tax limit but promised to abolish corporate tax in next 4 years step by step. Also, given corporate tax exemption for new business person. 4. Banking Reforms :- Banking sector and the thing which is related to common people is bank,which are expecting some reforms from budget 2016. There are many public sector banks which are sick and looking forward for instant aid, life support, quick succumb. To increase and enhance start up india and skill india program, government of india needs to add some fuel into public sector banks. 5. Tax Benefit for using Debit/Credit Card Transaction :- This was one of the promise made by finance minister in last budget 2015. This year we people really looking forward to have some tax benefit for using debit/credit card instead of paper money. This reform will help government of india to crumb black money issue, as this will emphasize people to use more and more plastic money. The banks generally charge 0.75 per cent to 1 per cent on debit card and upto 2 per cent on credit card usage which is most discouraging. Update :- No mention of this in union budget 2016. 6. Decrease TDS on Fixed Deposits :- As to benefit small investors and to increase small savings, government should decrease TDS (Tax deducted on source). Even Easwar committee’s recommendation, Reduce in TDS on FDs will increase more power to small saving schemes. Right now we need to pay 10% of TDS on Interest earned on FDs above Rs.10,000/-. These are some of expectation we have from budget 2016, wish most of them will be fulfilled. 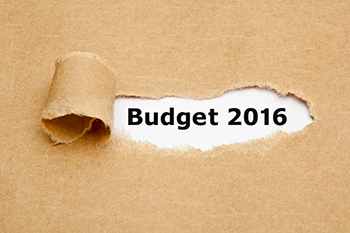 If we are missing something, do mention on below comment, what's your expectation from budget 2016.